Vipassanā (Sanskrit: vipasyanā) is the practice of Insight Meditation. While it is often referred to as Buddhist meditation, the practice taught by the Buddha was non-sectarian, and has universal application. It does not require conversion to Buddhism. While the meditation practices themselves vary from school to school, the underlying principle is the investigation of phenomena (Sanskrit: dharmas) as they manifest in the five aggregates (Skandha) namely, matter or form (Rupa), sensation or feelings (Vedana), perception (Samjna), mental formations (Saṃskāra) & consciousness (Vijnana). This process leads to direct experiential perception, Vipassanā. In a broader sense, vipassanā has been used as one of two poles for the categorization of types of Buddhist meditation, the other being samatha. Samatha is a focusing, pacifying and calming meditation, common to many traditions in the world, notably Hindu Yoga, from which much of Buddhist terminology derives. It is used as a preparation for vipassana, pacifying the mind and strengthening the concentration in order to allow the work of Insight. This dichotomy is also sometimes discussed as «stopping and seeing.» In Buddhist practice, it is said that while Samatha can calm the mind, only Insight can reveal how the mind was disturbed to start with, which leads to prajna (knowledge) and jnana (pure wisdom) and thus can lead to preventing it from being disturbed again. The term is also used to refer to a religious movement modelled after Theravada Buddhism which employs Vipassana and ānāpāna meditation as its primary techniques and places emphasis on the teachings of the Satipatthana Sutta. Vedana (sensation/feeling) is the primary initial subject of investigation. Vipassanā is a Pali word from the Sanskrit prefix «vi-» and verbal root √drś. It is often translated as «insight» or «clear-seeing,» though, the «in-» prefix may be misleading; «vi» in Indo-Aryan languages is cognate to our «dis.» The «vi» in vipassanā may then mean to see apart, or discern. Alternatively, the «vi» can function as an intensive, and thus vipassanā may mean to see deeply. In any case, this is used metaphorically for a particularly powerful mental self-perception. A synonym for «Vipassanā» is paccakkha (Pāli; Sanskrit: pratyakṣa), «before the eyes,» which refers to direct experiential perception. Thus, the type of seeing denoted by «vipassanā» is that of direct perception, as opposed to knowledge derived from reasoning or argument. Vipassana meditation is a very simple, logical technique which depends on direct experience, observation, rather than belief. It has three parts — adherence to a SilĂ (abstaining from killing, stealing, lying, sexual misconduct and intoxication), which is not an end in itself but a requirement for the second part, concentration of the mind (Samadhi). With this concentrated mind, the third, part of the technique (Panna) is detached observation of the reality of the mind and body from moment to moment. This practice both develops a deep, experiential understanding of the impermanence of reality and also brings to the surface and dissolves deep-seated complexes and tensions. Put another way, Vipassanā meditation consists of the experiencial observation of mind and matter (nama and rupa) in their aspects of impermanence, unsatisfactoriness and lack of an inherent, independent essence or self. To see through the mode of impermanence means to examine things as to whether they are permanent. To see through the mode of unsatisfactoriness means to examine things as to whether they are satisfactory or are imbued with suffering. To see through the mode of non-self means to examine things without the sense of clinging to the dharma. In other words, to see through non-self is to have a sense of non-doership and a sense of non-posessorship while examining things. In Vipassanā meditation, the meditation object is one’s own consciousness, although it can be further refined to be one’s consciousness while observing, say, the breath, as in ānāpāna meditation. In this context, the modes of seeing refers to focusing on those aspects of consciousness which appear to have (or not have) these characteristics. Some steps are described as Vipassana jhanas, or simply as knowledges. A major 19th century vipassanā instructor in Burma was Ledi Sayadaw. 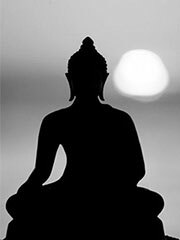 Today, the term «Vipassanā» also refers to a series of meditation techniques used by many branches of modern Theravada Buddhism, for example in modern Sri Lanka, Burma, Laos and Thailand, and to a specific branch of Buddhism popularized by the Indian businessman S. N. Goenka and his mentor U Ba Khin as a nonsectarian form of Buddhism, and also by Americans Joseph Goldstein, Sharon Salzberg, and Jack Kornfield (who were inspired by the monks Mahasi Sayadaw and Ajahn Chah) under the rubric «insight meditation.» The vipassana centres supported by S.N. Goenka are present around the world in more than 100 countries. Here locals and visitors can have vipassanā training, always given free of charge including accommodation and meals. Vipassana as practiced in the Theravada is the understanding of the Four Noble Truths that were taught by the Buddha. It is understanding the transitory nature of phenomena and the selflessness of persons, that the conceptual consciousness, «I» does not exist. Most of Theravada’s teachers refer to knowledges evolving during practice. The meditator gradually improve his perception of the three marks of existence until he reaches the step sensations constantly disappear, which is called bhanga nupassana nana: knowledge of dissolution. The yogi will then experience fear and ceasing of attachment, and eventually will reach the step of sankharupekkha jnana: knowledge of equanimity of formations. This step leads to the attainment of Nirvana. The main thing a meditator should know is before you start doing Vipassana its better if you had some experience doing Samatha or Calm Meditation. Because if you can quickly calm your mind and keep the mind in one object then doing Vipassana will be easy. And you should keep in mind that you should have a instructer to do Vipassana meditation in particular unlike Samatha. Mahayana Vipassana consists of meditating on the two truths: conventional truth and absolute truth. One realizes that phenomena likewise have a lack of inherent existence, and have the nature of emptiness (Shunyata). This is determined by the inferential path of reasoning and direct observation through meditation. Gradualism or subitism and the realisation is a debate in the Mahayana. Nevertheless, Huineng, sixth patriarch of the Chan, considered the practice cannot be described as gradualistic nor subist, but implies people with more or less clear minds. Mahamudra and Dzogchen use Vipashyana extensively, though in a different manner than in the Theravada. In the Vajrayana (Tantric) path, the true nature of mind is pointed out by the guru, and the practitioner takes the path of direct experience.